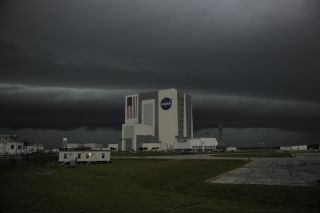 Storm clouds loom over the Vehicle Assembly Building at NASA's Kennedy Space Center in Florida. NASA is gearing up for space shuttle Endeavour's final flight next month, but Mother Nature hasn't been cooperating lately. Powerful storms tore through Florida's Space Coast yesterday and today (March 31), cutting short some astronaut training exercises and delaying inspections of Endeavour. The shuttle is sitting on the launch pad at NASA's Kennedy Space Center (KSC) in a vertical position — all set up for its blastoff on the STS-134 mission on April 19. A funnel cloud was reportedly sighted near Endeavour's Launch Pad 39A at about 8:30 EDT this morning, and a tornado watch remained in effect until early afternoon today, NASA officials said. The lousy weather forced indoors a NASA press conference that was supposed to be held at the pad, and tweaked a variety of other plans. "Thanks for coming out on this beautiful Florida morning," Endeavour commander Mark Kelly told reporters with a wry smile today. "The weather today is going to change our plans for training at the pad." Kelly and Endeavour pilot Greg Johnson, for example, had to curtail their flights in NASA's shuttle training airplane — which helps astronauts prepare to land the shuttle — today. After extended practice in the vehicle yesterday, both had to shut things down early today, Kelly said. Today's bad weather also is delaying attempts to do a thorough survey of Endeavour and the pad — a necessity to check for damage after yesterday's strong storm. According to the U.S. Air Force's Weather Squadron, the launchpad saw sustained winds of 57 mph (50 knots) yesterday, with a peak gust of 90 mph (79 knots). Hail was spotted near the pad, and there was a lightning strike about a half mile from the pad’s center, officials said. Initial assessments indicate very little damage to Endeavour — perhaps only some minor nicks to the foam insulation on the shuttle's external fuel tank, officials said. But technicians will need to do a thorough survey to make sure the weather didn't cause any larger problems, they added. "This is the time when our training meets the processing of the vehicle," Kelly said. He added that, despite the weather, everything's on schedule to finish up the dress rehearsal tomorrow. Will Gabby watch the launch? Kelly is married to Arizona Senator Gabrielle Giffords, who is recuperating in a Houston hospital after being shot in the head in Tucson in January. Giffords is apparently making great strides in her recovery, and some have speculated that she might be able to make the trip to Florida to see her husband off. Kelly anticipated this question, addressing it at the beginning of the press conference. "We're still working on plans," he said. "We don't have final approval from her doctors yet, but we are pretty hopeful that she may be able to get down here." Endeavour's final mission is a 14-day spaceflight to deliver an instrument called the Alpha Magnetic Spectrometer to the International Space Station. The experiment is a huge detector designed to study cosmic rays and antimatter, and peer into the building blocks of the universe. The mission will be NASA's 134th shuttle mission since the fleet began launching into space. It will be Endeavour's 25th flight, and it will blast off just one week after the 30th anniversary of NASA's first shuttle mission – STS-1 – which launched on the Columbia orbiter on April 12, 1981.